Take a canal boat ride. Listen to stories of the old canal days inside the National Canal Museum. Visit one of the few remaining locktender’s houses on the Lehigh Canal. Have a chat with Hank and George, our canal boat mules. Bike the lovely D&L Trail along the canal and Lehigh River. Take a paddleboat or canoe ride on the canal. Bring a picnic lunch and enjoy a quiet meal in a lovely setting. Bring your binoculars and take a bird walk on a shaded trail. There’s plenty to do in Easton’s Hugh Moore Park. 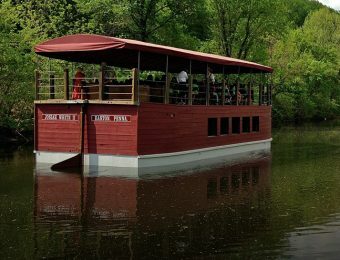 The Josiah White II canal boat is Pennsylvania’s only mule-drawn canal boat attraction. An authentically-dressed crew navigates the 50-foot, two-level passenger boat on a 45-minute tour of the Lehigh Canal from the canal museum to the locktender’s house and back. Hank and George, our hard-working mules, provide the power. An easy walk along the towpath brings you to the Locktenders House, which is open Fridays, Saturdays and Sundays – 11:30AM to 4:30PM – during the canal boat season. Our volunteer interpreter will explain the important job locktenders and their families played in the daily operation of the Lehigh Canal. 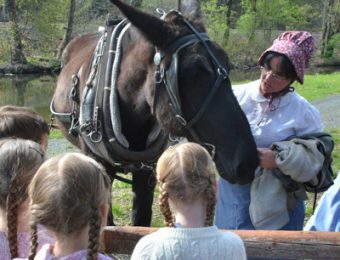 Relax in the perennial flower garden behind the house and enjoy the view of the Lehigh River, or take a stroll along the riverbank where you’ll learn more about navigation on the Lehigh in the 19th century. The D&L Trail in Hugh Moore Park connects walkers, bicyclists and runners to the region’s national significant heritage. It travels along the Lehigh Canal to the Locktender’s House and Garden. 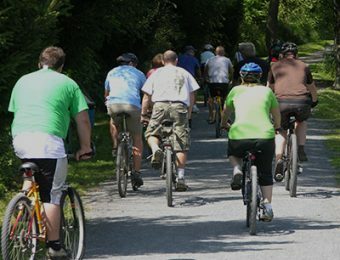 Beyond the Park, the D&L Trail connects you to historic downtown Easton and nearby communities like Freemansburg and Bethlehem. Going further, the 165-mile network extends from Wilkes Barre, through the mountain of northeast Pennsylvania in Carbon and Luzerne counties, along the Lehigh River through the Lehigh Valley, and along the Delaware Canal and Delaware River.through Bucks County to Bristol. Click here to visit the D&L website. The Emrick Technology Center is home to the National Canal Museum and is also the headquarters of the Delaware & Lehigh National Heritage Corridor. Built in 2006 through a generous donation from Mrs. Elaine Emrick – in memory of her husband Peter – the 14,000-square-foot, two-story brick building houses museum exhibits on the first floor and the D&L offices and a state-of-the-art national canal archives and library on the second floor.